You can use whatever yarn and hook you desire. The thicker the yarn and the larger the hook – the bigger the hat. Most of these I made for newborns and I used worsted weight yarn and a size H hook. 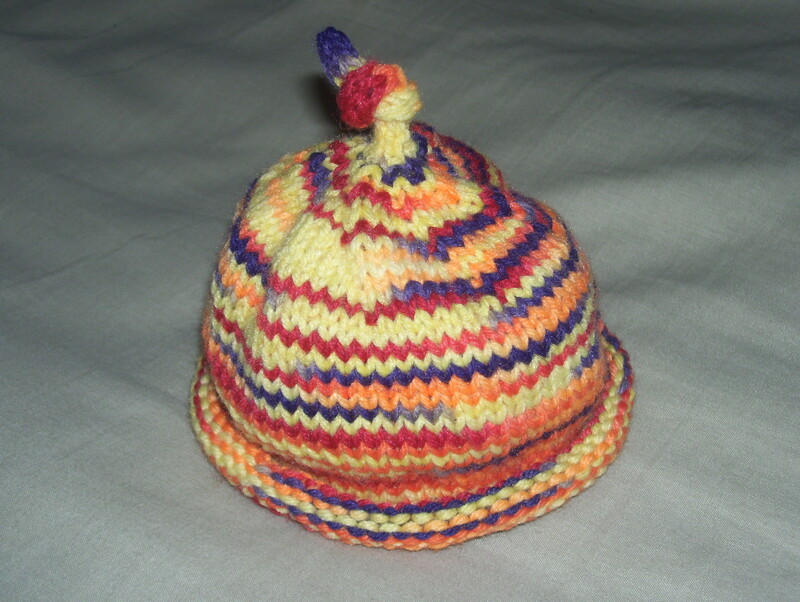 Using sport yarn and a size G or F hook would make a preemie hat. Chunky yarn and a size K hook would most likely yield a hat to fit about a 6 month to 1 year old size, although this has not been tested. Rnd 2 – Sl st in next dc, ch 3, 2 dc in same dc. Ch 1, 3 dc in ch 2 space, ch 1, 3 dc in center dc of next block. Repeat around. You should have 1 block in each ch 2 space and 1 block in each center dc. Total of 6 blocks (18 dc). Rnd 3 – Repeat Rnd 2 for a total of 12 blocks and 12 spaces. This will continue to be your total for the remaining rnds. Rnd 4 – Ch 4 (acts as ch 3 (3rd dc when you get back around to it) plus ch 1 for space), 3 dc, ch 1 in each space around to last space. The last space will only have 2 dc, then join with sl st to top of ch 3. Rnd 5 – Sl st in space, ch 3, 2 dc in same space, (ch 1, 3 dc in next space) around. Alternate rnds 4 and 5 until desired depth is reached. For my baby hats, I did a total of 8 rounds, then the border. Shell border – sc in the center dc of each block, and do 5 dc in each space around. This makes a quite adorable little flair outwards, but would probably not look that good on a boy hat. You could also just do a backwards sc around for a more ropey look that would be good for a boy. Another border option would be to do 3 dc in every st around for a nice ruffle. Now for the back story. A friend on Ravelry challenged my knitting group to help make some baby hats. I whipped one out really quick, but then gave it to Steve to take down to FL with him to give to his younger sister who’s expecting the same time as me. Then I discovered that this “friend” is knitting hats like mad. I believe she’s already posted at least 5, perhaps more. So, I thought, well, I knit pretty fast, but I crochet like the wind. 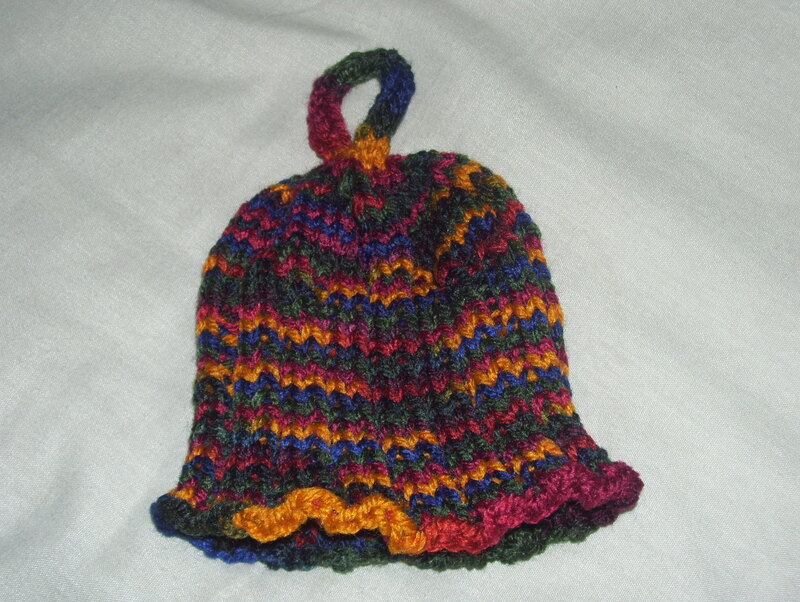 I went trolling through the Ravelry crocheted baby hat patterns, and found several I liked. There was one, a granny square pattern that turned out way too big. I don’t know if I’m using too big yarn or too big hook, but I didn’t stop to find out. I just frogged the thing and re-started it in a way that would make it end up small enough, and thought it might be a good idea to go ahead and write down what I did in case anyone else wants to copy. Pattern link on Ravelry is here. Just so you know, here’s the other 2 hats I knitted up in the mean time as well. I never even got a picture of the first hat before giving it away. Baby hat #1, pattern here, and made in stockinette instead of the ribbing. Baby hat #2, made with a circle of I-cord instead of the knot. Same pattern as above. Did a provisional cast on for the I-cord, then did about 20 rounds before unzipping the waste yarn and picking up the original 4 st for a total of 8. Then just continued down the pattern like normal. The joining did leave a little hole at the top, but I used the tail of the yarn to weave back and forth a few times to hide it. I think it turned out pretty cute. If you notice any glaring errors in the pattern, please let me know and I’ll correct them right away. Also, if anyone come up with a snappier name for the hat that’d be great. 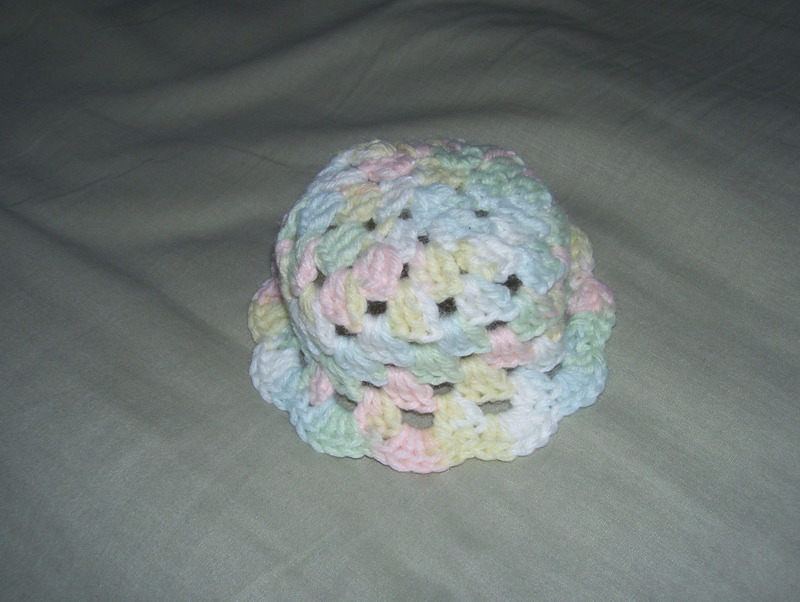 Crocheted hat, while quite accurate in it’s description, lacks a little, oh, I don’t know, something.